It is expected that demand for gas will rise, especially in the longer term. It is cleaner, more efficient and cheaper than oil. (The cost of heating an average American house is three times more expensive using oil rather than gas). Europe has become addicted to gas consuming 447 Billion cubic meters in 2016 (a 6% annual increase), and Russia, is the biggest supplier delivering, via established pipelines, one third of European demand. It now plans to build a new pipeline (Nord Stream 2) from Russia to Germany to supplement the existing network and ensure uninterrupted supply as future demand grows. But Europe is unhappy with this plan (especially Eastern Europe). Obliged to strictly observe and follow US anti-Russian policies which aim to weaken Russia economically and militarily and dislodge it from its high geopolitical perch. Accordingly, The EU countries have not only blindly applied US sanctions on Russia, to the detriment of their economies, but also, have exposed their citizens to the danger of total annihilation and destruction, by hosting US nuclear missiles and armies directed at Russia. As such, the EU has obediently toted the line and for has years thrown multiple wrenches in the pipeline project cogs. Existing EU laws were negatively misinterpreted, or new unfavorable laws and regulations were promulgated. 1 USA 766,200,000 2015 est. 2 Russia 603,900,000 2014 est. 3 Iran 174,500,000 2014 est. 4 Qatar 160,000,000 2014 est. 5 Canada 151,500,000 2014 est. 6 China 123,500,000 2014 est. 7 Norway 108,800,000 2014 est. 8 Saudi Arabia 102,400,000 2014 est. 9 Algeria 83,290,000 2014 est. 10 Turkmenistan 76,000,000 2014 est. 11 Indonesia 73,450,000 2014 est. 12 Netherlands 70,280,000 2014 est. 13 Malaysia 65,420,000 2014 est. 14 Australia 62,640,000 2014 est. 15 Uzbekistan 61,740,000 2014 est. 16 UAE 54,240,000 2014 est. 17 Egypt 48,800,000 2014 est. 18 Mexico 44,370,000 2014 est. 19 Nigeria 43,840,000 2014 est. 20 Thailand 42,150,000 2014 est. 25 Oman 30,900,000 2014 est. 34 Bahrain 16,900,000 2014 est. 36 Kuwait 15,030,000 2014 est. But now, the latest straw seems to have broken the camel’s back. Trump’s election as president has brought in someone whose demands on the EU are not just excessive, but also are presented in a roughshod manner. And, to top it all, the US has suddenly changed from a generous leader who always picks up the tab, to a penny-pinching scrooge demanding the economically sick EU pay to billions more for NATO’s and their own defense expenses. He also managed to hit the sorest possible spot, by criticizing Germany for its excessive exports to the US with minimal balancing imports, blaming it for exacerbating the US balance of trade deficit and its crimson balance of payments. The final straw was last week, when the US senate passed with an overwhelming majority (98 to 2) a new set of Russian sanctions that penalize any company that participates in the construction of the new Russian pipeline or provides any financing services to it. This law is primarily directed at German and European companies, and although it has temporarily stumbled due to procedural errors in Congress, it is likely to be represented and passed. The estimated costs of the Nord Stream 2 project are 8 – 9 Billion Dollars, and that is mouthwatering even for rich countries. Germany and Austria immediately reacted violently, and for the first time in seventy years (since the end of the WW 2) retorted by threatening to counter such sanctions, insinuating that they would reciprocate with sanctions against the US!! They also, accused the US of using politics to further their economic interests and forcing the EU to buy more expensive US LNG gas. The moral here seems to be: “Do what you wish, but stay clear of my pocket”. As for Russia, it continues to progress the project and is not worried about the construction part as it has ample specialized contracting companies ready to break ground on short notice. It has also restructured the project financing to a part self-finance and part financing from Chinese banks with whom it is presently in communication with. Russia did not stop there, but went further and negotiated late last year with the Turkish government to build the “Turkish Stream Pipeline” to transport gas from Russia to Turkey. 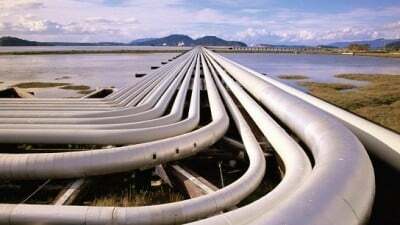 After satiating Turkish demand, the excess gas will be piped to Southern Europe, with lucrative transit fees to Turkey. Work on this project recently broke ground, a mere seven months after signing the accords! But hark, where are all the other gas producers? Where are the US ambitions to shrink Russian gas sales and substitute Arab, American and even Iranian gas sales? Where are the gas pipeline projects via Iraq, Syria and Lebanon to the Mediterranean and hence Europe? Are any of these still likely or even valid? Will these be reasons and justification for the continuation of the current conflicts, or create new ones? Or will the US issue new sanctions on whoever consumes Russian gas anywhere in the world?